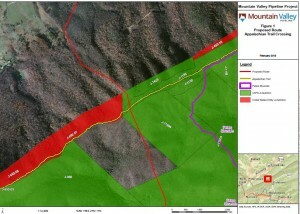 Mountain Valley Pipeline (MVP) of Pittsburg has proposed a 42-inch pipeline over 300 miles long to connect fracked natural gas fields in West Virginia to markets on the East Coast and overseas as far away as India, and the Federal Energy Regulatory Commission (FERC) will decide whether to approve this proposal. Volunteers from RATC and the community developed comments to FERC with help from Laura Belleville, the Appalachian Trail Conservancy’s conservation director and the new ATC Policy on Pipeline Crossings(policy-on-pipeline-crossings-2015). 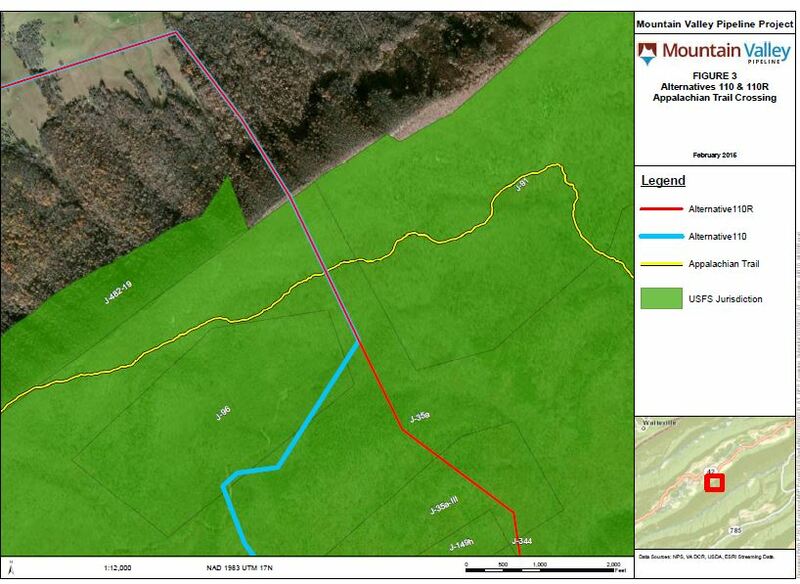 The proposed pipeline would cross the Appalachian Trail at one of three locations. Excerpts from the RATC’s comments on these specific locations are shown below. o From the south on the AT, the scars from construction would be highly visible from Angel’s Rest, one of the most scenic viewpoints maintained by the RATC. 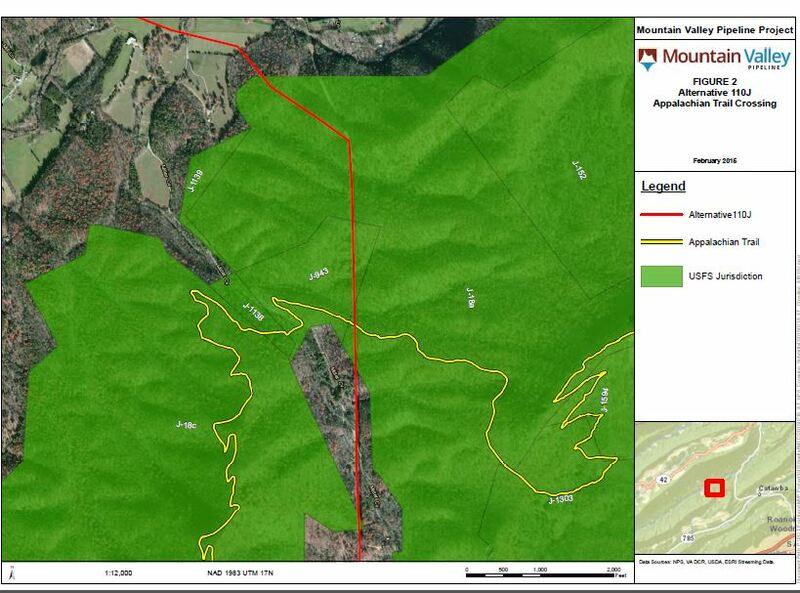 o From both the east and west, the view would be impaired by the sight of the 125-foot-wide (and in places, more) pipeline corridor extending down Peters Mountain into the valleys and onto Johns Creek Mountain, which the proposed route would also cross. o During construction, the view would be of exposed dirt, noisy and pollution-producing vehicles and equipment. Forever after construction is completed, there would be a scar on the landscape. o The valley between Johns Creek Mountain and Sinking Creek Mountain is quite narrow here (generally 3 to 4 miles wide), with three scenic viewpoints on the ridge of Sinking Creek Mountain according to the official ATC map. Much of the course of the pipeline in the Sinking Creek valley would likely be visible from these Sinking Creek Mountain viewpoints. o Continuing northbound on the AT, Alternate 110 would be visible from the crest of Sinking Creek Mountain as it splits away from Alternate 110R. o Still further north, it is possible that the pipeline would be visible from two scenic viewpoints in Brush Mountain Wilderness East, including the Audie Murphy Memorial Monument. Detailed maps of the proposed route were not available in time to allow inspection of this possibility, but it must be noted. Alternate 110R crosses the top of Sinking Creek Mountain at the same location as Alternate 110 before breaking off to the southwest. 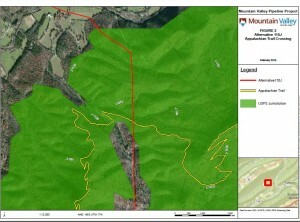 o Alternate 110R would have all of the negative viewshed impacts of Alternate 110.
o The land between Brush Mountain Wilderness and East Brush Mountain Wilderness would become a large scar, visible from Sinking Creek Mountain at a distance of approximately 3.6 miles and from other locations on the AT. o It would parallel very close to the trail as both pipeline and trail begin their descent down the east side of the mountain, with all of the dangers that such proximity brings. 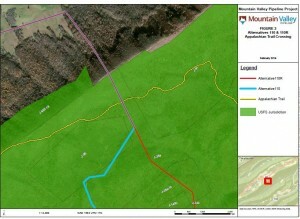 o It seems unlikely that the pipeline could be constructed within the power line corridor without straying into one or the other of the two wilderness areas, and in any case the construction of the pipeline would be a serious intrusion to the wilderness values of two such close neighbors. o In this section, the power line passes above the forest floor and leaves large trees, the understory and a rich habitat between the Brush Mountain Wilderness and the Brush Mountain East Wilderness largely untouched. Construction of a pipeline would destroy this corridor on the ground, essentially fragmenting what is now a joined habitat. It would also require a massive amount of earth moving on steep side slopes, followed by flattening of the corridor for construction – basically destruction of an intact mature forest, to be replaced by a grassy area that would devastate biodiversity and encourage invasive species. o The globally rare Buckleya distichophylla (pirate bush) has been documented on the Appalachian Trail in this section by an RATC volunteer. Alternate 110J goes further east, crossing the AT on Brush Mountain just after the trail turns to descend Brush Mountain, then sidesloping the east side of Brush Mountain. o Alternate 110J crosses through the Craig Creek Valley between Sinking Creek Mountain and the Brush Mountain/Cove Mountain gap at a very narrow point, where the valley is less than 3 miles wide. 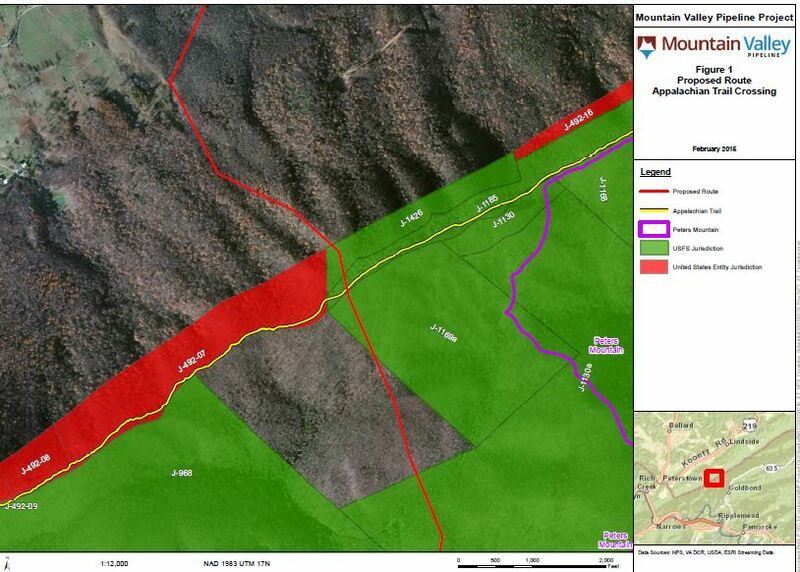 The pipeline would potentially be visible as it crosses the valley from scenic viewpoints on the AT, including 4 scenic viewpoints in the Brush Mountain East Wilderness (including the Audie Murphy Monument). o Continuing northbound on the AT, the pipeline would be visible from scenic overlooks on Cove Mountain and on Dragon’s Tooth, which is part of Virginia’s Triple Crown (Dragon’s Tooth, McAfee Knob, Tinker Cliffs) a destination hike for both dayhikers and backpackers from a multi-state region. This is one of the most scenic locations on the AT in Virginia. o Alternate 110J also appears to pass through the Brush Mountain East Wilderness, where no motorized equipment is permitted by law. o This option would cause even more erosion than a direct mountain crossing.